Softness is the key to achieving a romantic finish. Start by washing your locks with TRESemmé Botanique Nourish and Replenish Shampoo and conditioner to help moisturize and smooth the hair shaft before styling. Using your fingertips, apply a small amount of TRESemmé Beauty-Full Volume Mousse from roots to tips before rough drying. The lightweight formulation helps to add texture and body without leaving stiffness or stickiness – your hair needs to move naturally for this half bun to work its magic. Part your hair vertically down the centre, then again horizontally from ear to ear. 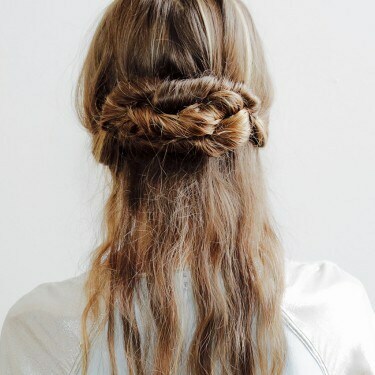 For now, pull the lower half of your hair into a ponytail to keep it in place. Take the loose section of hair on one side and twist it back towards the centre of your crown. Once you’re half-way through the twist, split your hair into two sections and then twist these strands around each other. Use a bobby pin to secure the completed twist, then repeat on the opposite side. Once you’ve completed the other side, twist the two pulled back sections around each other to create a wide, flat bun. You can now free your hair from the low ponytail. Spray the loose hair generously with TRESemmé Perfectly (un)Done Sea Salt Spray to add tousled texture and encourage natural waves. Tip: create gentle 'S' waves using a flat iron if you need more movement. Tame any frizz with TRESemmé Perfectly (un)Done Ultra-Brushable Hair spray to complete an effortlessly chic look. What are you waiting for? Take this runway-ready style and make it your own by playing with the thickness of the bun and pulling out more strands – the more (un)done the better!